The European Union says that Russia's sanctions recently imposed on Ukrainian companies and individuals are groundless and are aimed at aggravating the conflict situation. "The Russian government's decision to introduce financial measures against Ukrainian individuals and companies is groundless. 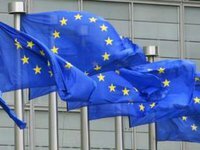 There is a need to avoid steps aimed at aggravating the situation and undermining the search for a decision for the sake of restoring the territorial integrity of Ukraine," the press service of the Delegation of the European Union to Ukraine told Interfax-Ukraine on November 2. As was earlier reported, Russia on November 1 imposed sanctions on 322 Ukrainians and 68 Ukrainian companies. Among those affected by the sanctions are judges of the Constitutional Court of Ukraine, deputies of the Verkhovna Rada of Ukraine, officials of the presidential administration of Ukraine, top government officials, and large Ukrainian companies.